The highest-grossing silent film of all time, as well as the first realistic war drama, The Big Parade tells the harrowing story of a young man’s (John Gilbert) front-line experiences in World War I. The film was adapted by Harry Behn and King Vidor (who wasn’t credited) from the play by Joseph Farnham and the autobiographical novel Plumes by Laurence Stallings. The film was directed by King Vidor and it stars John Gilbert, Renée Adorée, Claire Adams, Karl Dane, Robert Ober and Tom O’Brien. Timed to celebrate the fifth anniversary of The Twilight Saga’s original theatrical debut, fans are invited to relive the immortal love story with Twilight Forever: The Complete Saga, available as a 10-disc Blu-ray (plus Digital HD UltraViolet) set and as a 12-disc DVD (plus Digital UltraViolet) set debuting November 5, 2013 from Summit Entertainment. Whether Team Edward or Team Jacob, the passion of Twilight fans hasn’t dissipated with the final film, continuing through fan fiction, pop culture and the constant engagement of over 166 million fans in Twilight’s online network. Twilight Forever: The Complete Saga encompasses all five films, over 2 hours of brand new exclusive content and over 10 hours of every special feature ever created for the multi-billion dollar franchise. 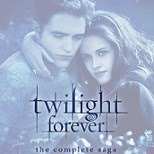 Twilight Forever: The Complete Saga is the ultimate collector’s set, an immersive experience for every Twilight fan to recapture and relive their most epic romance of the century.